TOP > Arch Dale portrait with his creations, the Dog, the Little Man and a Doo Dad drawn by Free Press artist Robert Reck. Arch Dale was born in Dundee, Scotland on May 31, 1882 and in later years would bitterly recall the poverty and violence of the slum-dwelling coal miners, factory workers and their families. At the age of seventeen Dale began his career as a cartoonist, first on the Dundee Courier and later on the Glasgow News. He relocated to London where he worked on the early comics published by Alfred Harmsworth; Comic Cuts and the Funny Wonder. The two comics were bundled together and sold overseas in Canada at five cents a shot. Dale’s editor in London gave him ship-fare for Canada where he took up homesteading in the Touchwood Hills, in Saskatchewan, an area of rolling hills, grass, and water, ideal for cattle-ranching. Dale’s homestead was 100 miles from a railway and he later claimed it was his craving for cigarettes that led him to move all the way to Winnipeg where in 1907 a cartoon submitted to the Winnipeg Free Press was accepted. He continued contributing cartoons to the Free Press and added the Grain Growers' Guide to his list of clients beginning with editorial cartoons in the October 1908 issue. 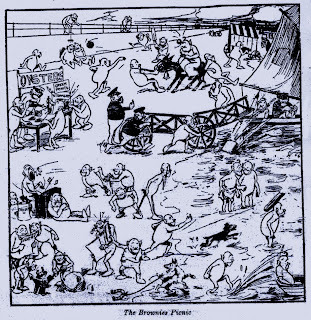 The Doo Dads were foreshadowed in a busy 28 August 1909 single-panel titled The Brownies Picnic, featuring naked long-legged creatures engaged in various escapades. In 1910 he returned to Scotland for a visit. From Scotland he moved on to Manchester where he accepted a position as staff cartoonist, replacing Percy “Poy” Fearon on Hulton’s Daily Dispatch. 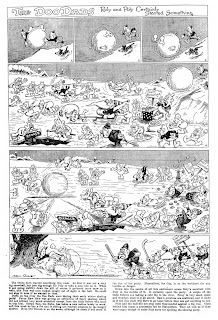 Here, also, he drew a series called The Imps (1912-1913) for Ideas, also published by the Hulton Press. The Imps resembled Dale’s earlier Brownies, one of whom was to be seen reading a paper titled Ideas in the 1909 cartoon. This suggests that Dale may have worked for Hulton before his move to Canada in 1906. 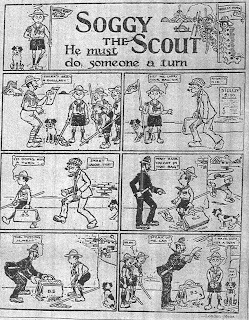 The Imps comics were reprinted in the Toronto Star Weekly in 1913. Another Ideas strip was Soggy the Scout. Dale left Manchester, joining “Poy” on Northcliffe’s London Evening News then returned to Canada in 1913 to rejoin the Winnipeg based Grain Grower’s Guide where he created the Doo Dads on October 24, 1917. Whereas the Brownies and the Imps were grotesque, lean creatures with long legs, the Doo Dads were small, cute, roly-poly fellows with fried-eggs for eyeballs. Dale soon added Lady and Baby Doo Dads, in response to readers letters. In the later years of the war the Doo Dads single-panel with captions was running on children’s pages in newspapers coast to coast. Our heroes even took on the beastly Hun Dads, who had moustaches, wore spiked helmets and spoke pidgin English. In 1919, Arch Dale married Claire Porter in Winnipeg, their daughter Julie Dale, cartoonist and illustrator, would become head of the Free Press art department in the fifties. In December 1921, Arch Dale went to Chicago to work with the Universal Feature and Specialty Co., where he syndicated his Doo Dads (1921-1927). 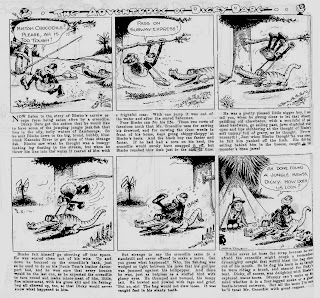 The Doo Dads ran in the US until 1924 as a single-panel cartoon then branched out with a color Sunday page on 13 Feb 1924. 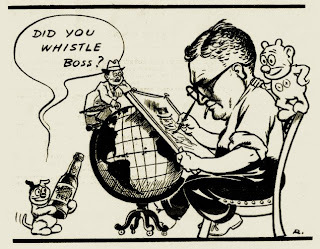 At this time there is a distinctly noticeable George Herriman influence in Dale‘s comic pages, probably due to his assistant Fred Neher, who helped with lettering and backgrounds. 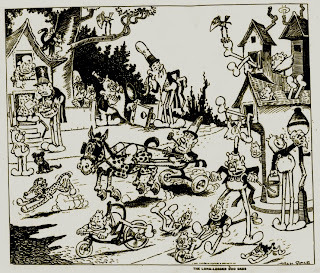 Neher was an Indiana cartoonist and creator of Otto Watt, Goofey Movies and Life‘s Like That. With the loss of Arch Dale the Grain Grower’s Guide replaced his editorial cartoons with those of Bert Billings (also one of Dale’s replacements in 1910) but continued to publish book collections and run the Universal Feature’s Doo Dads in black and white, until Dale’s return in 1926. 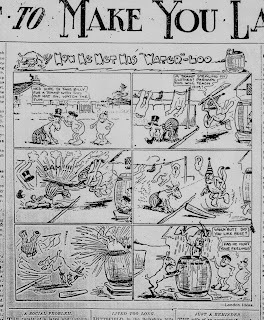 Dale may have grown tired of the Doo Dads because upon his return he immediately began a new comic strip in the Guide, The Adventures of Dickie Dare, which began on 27 January 1926. Dickie Dare was a jungle strip which took place on the wonderful Isle of Zamboango. 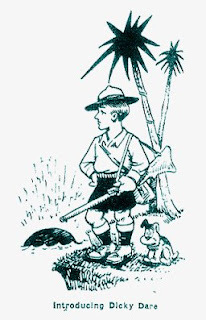 Dickie, accompanied by a dog, Stumbo, and a stereotyped African named Bimbo, fought lions, snakes, woggle-bugs and Scissors-Bill, a hungry crocodile. Word balloons were reinforced with large blocks of unnecessary text running under the panels. In their little wee Scotch caps. On 1 April 1926 The Adventures of Dickie Dare was discontinued and The Doo Dads returned on 1 May 2006. Word balloons replaced text in a five part multi-panel serial in the American style titled The Mysterious Whatsit. 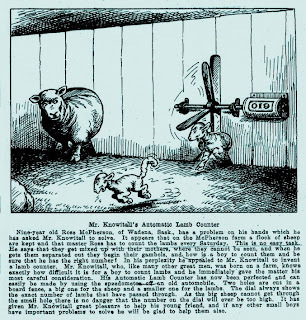 Another feature was begun in the late twenties, Mr. Knowitall, a single-panel in the Guide reminiscent of Rube Goldberg’s inventions. Dale would continue with his editorial cartooning until his retirement in 1954 when he was succeeded by Peter Kuch as staff artist. Arch Dale’s wife passed away in 1955 and he followed seven years later in the spring of 1962, at eighty.